March 28, 2015, 9:15 p.m. This article is not clear to me. Mr. Black’s comment is right to the point. I think you first have to define the world to which your article will apply. For me, at the limit,and for the time being, the only no-free-lunch-world is Earth. Within that global world, one can define all sorts of lesser worlds where one could argue that he got a free lunch. But it can only be at the expense of his outside world. If a company can pay back its debt, surely it means that profits generated in its outside world, have shown up within the company world. So, the way I understand it is to say that as long as Mrs. Watanabe stays in Japan and consumes only local things, she may experience little or no inflation, even deflation. But as soon as she sets a foot outside her Japanese world by consuming items coming from the ouside world, she will realize that the price goes up 33%. Does it hold water? March 28, 2015, 9:13 p.m.
As my son is 18 and in all probability will fledge from our “nest” into the Military in about 22 months (not coincidentally after our current resident Narcissist-in-Chief leaves office), I’m trying to teach him some of the important “life lessons” that aren’t necessarily covered in the “minimum educational requirements” issued by our state. One of the things that I’m trying to “drive into his head” is the danger of debt. As my wife and I have experienced lessons on debt from a first-hand perspective, we’d like to keep him (and my daughter and anyone else that will listen to the teaching that we got from Crown Financial Ministries) from making the same mistakes and learning the hard way. (I also understand what the Reverend David Chadwick, a preacher that is on the local radio station, said about making mistakes as a young adult - while we try to keep our children from reliving our nightmares again, they may or may not follow our advice on these mistakes and they will make their own mistakes, as well as repeating some of ours….) I’ve shown him the debt clock, with his share of debt. I’ve shown him and he’s learning first hand just how much the government is taking for taxes, Social Security and Unemployment Insurance and warning him of the Ponzi Scheme of Social Security and how he will NEVER SEE DIME ONE of his “contributions” to that fund. I’ve even included (much to his chagrin) the signing of a long term contract for a smart phone in this lesson, telling him that this is presuming on his future ability to pay and fulfill the contract obligations. So when Paul Krugman says that “nobody understands debt,” I’d like to grab the keyboard that he’s been typing on and “stick it where the sun doesn’t shine (on/in his body).” In Proverbs, King Solomon said that “the borrower is slave to the lender.” I understand that the Bible is considered as “old school thinking,” but it carries much wisdom, if you’re willing to open your mind to it. So, wisdom isn’t cool. That is part of the problem, whether it is a young man getting ready to experience adulthood, or an economist with an over-sized ego and a Nobel Prize in Economics. Being cool trumps many things, until you’re ready to give up your “coolness.” But as the Keynesian’s would say “in the end, we’re all dead anyway (which really means, “Handle it and deal with the consequences, young man. I’ve paid into it. I’ve earned it. And I deserve it. I’m getting mine, screw you….”). As for the general debt, our Representatives in the “People’s House, the Senate and the Presidency have failed to do the job for which they’ve been elected and are being paid. So only an Article 5 Convention of States that produces a deliberate set of Term Limits and Constitutional Balanced Budget Amendment and are both passed by 34 states will stop the overspending…. March 28, 2015, 9:09 p.m.
March 28, 2015, 7:10 p.m.
“Further, wars are the epitome of nonproductive spending, even when they are necessary for survival.” My economics professor told me this in 1955. He claimed it was because all the materiel made for war was shortly destroyed and therefore had no lasting economic value. I later wished I had had the wit to ask him if he had ever heard of the agriculture/food sector: most of its products end up in the sewer in pretty short order. Is this nonproductive spending? March 28, 2015, 6:57 p.m.
You might read and comment on Richard Duncan’s book The New Depression in which he writes that the debt level is unpayable already but the solution is to continue on the wheel and expand more and more debt - but just use it to finance other things. 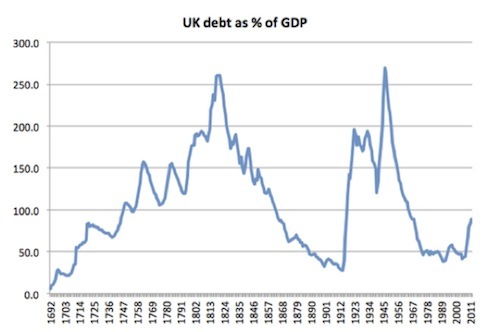 But the difference between ‘good’ and ‘bad’ debt actually is that ‘good’ debt finances investment that will create wealth that can pay back that debt in stated time frame - but ‘bad’ debt finances consumption which does not create wealth but destroys existing wealth. Another way to look at debt is that it it paying today for consumption that them must be forgone in future. Credit=debt and credit is already over 95% of the actual money supply. One problem is that the true components of the money supply itself are not understood. Credit IS money and always has been a component to one degree or another of all money supply systems. Money is NOT simply currency. It existed for thousands of years before currency was invented. So to decrease debt means reducing credit which means reducing the size of the money supply - in other words deflation. March 28, 2015, 5:01 p.m.
March 28, 2015, 3:46 p.m.
You are completely correct that under QE savers and entities living on fixed income instruments pay the cost of past excesses. However if economic growth were to be generated by a responsible fiscal policy which used deficit spending to create projects and incentives which expanded employment and productivity (infrastructure etc.). This would not be the case. Benefits would be shared between bond holders, equity owners and employees. There would be more inflation but not necessarily the runaway kind. For the US, that was generated by a unique set of circumstances that occurred between 1968 and 1983 that are not likely to reoccur. Similarly the fiasco we call the EURO will not reoccur again although we still haven’t figured out how to fix this one. In the end the problem is not economics, it politics and about changing the came of creating winners and losers to one of creating a team of winners. March 28, 2015, 3:30 p.m. 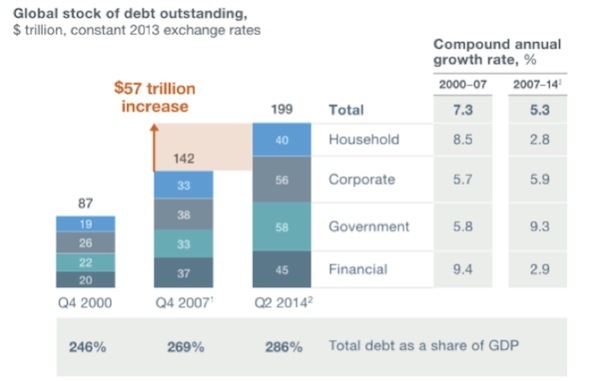 The world’s debtors, as a whole, are not repaying any debt or debt service. They are rolling over total debt and borrowing the debt service when it is above zero (in Germany, lenders now pay their borrowers debt service—negative interest rates). Thus, we have not yet reached the place where “...a country or company is using current cash flows to repay debt that was incurred for nonproductive purposes, that limits its ability to use that cash for other purposes.” No present or future consumption has yet been denied. Until that time, debt accumulation is free of the costs. The current problem, even without debt or interest repayment, is that national and world GDP is debt-fueled by about 5-10%. If that annual consumptive debt accumulation merely stops, without any repayment or debt service, GDP drops by 5-10% plus its multiplier. That’s called a recession or severe recession, and the Fed has no ammunition left to reverse it. Don’t ask when will countries, companies or individuals repay debt or debt service with current cash flow—they probably won’t. Ask when will they merely stop accumulating more debt. The “endgame” does not require the repayment of any debt or debt service, just the end of more accumulation. March 28, 2015, 3:20 p.m.
‘Aside from not being able to generate inflation, the Japanese economy is doing as well as can be expected…’. ‘She has seen the purchasing power of her currency drop by 33% in the last few years’. These two statements seem to be totally contradictory. March 28, 2015, 3:10 p.m.
Letter very interesting. And Italy is a country at risk? Its debt is exaggerated compared to the yield on government bonds which are now at 1.3%?